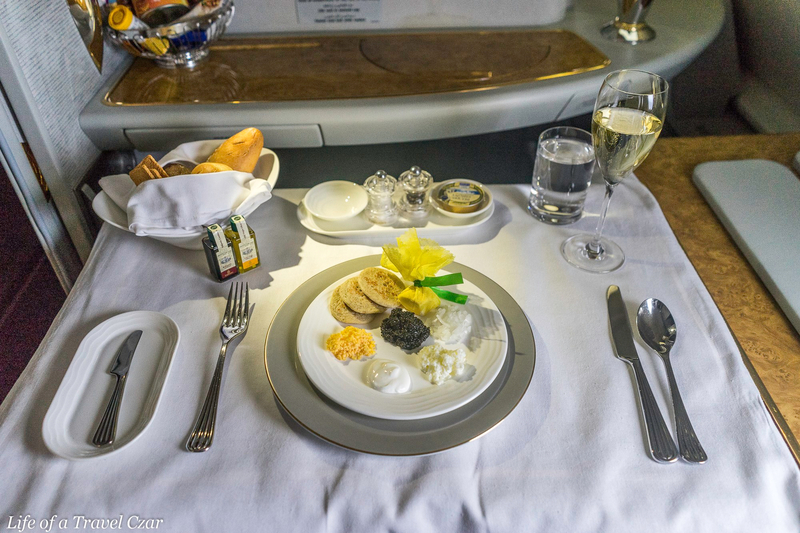 I disembark from my flight from New York and make my way to the Emirates First Class Lounge. The Lounge occupies an entire floor across the terminal and has a range of lounge areas, a kid’s facility, dining areas, bathrooms with showers and a spa. I settle into dinner. I start with the Foie Gras Terrine with Wild Fig Jam. 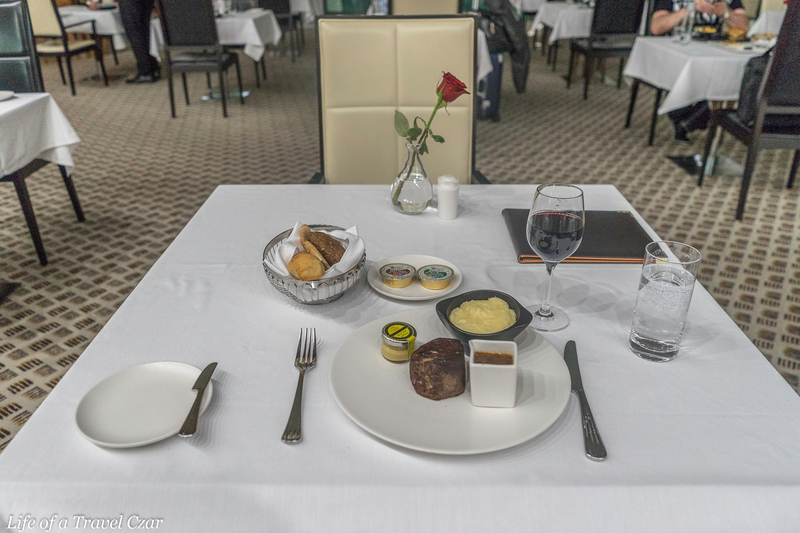 For the main course I opt for the beef tenderloin with mash potatoes and mustard. I have a shower to freshen up. The shower has beautiful mosaics and proves to be the epitome of aesthetics. Before heading over for a beautiful spa treatment which is so rejuvenating. 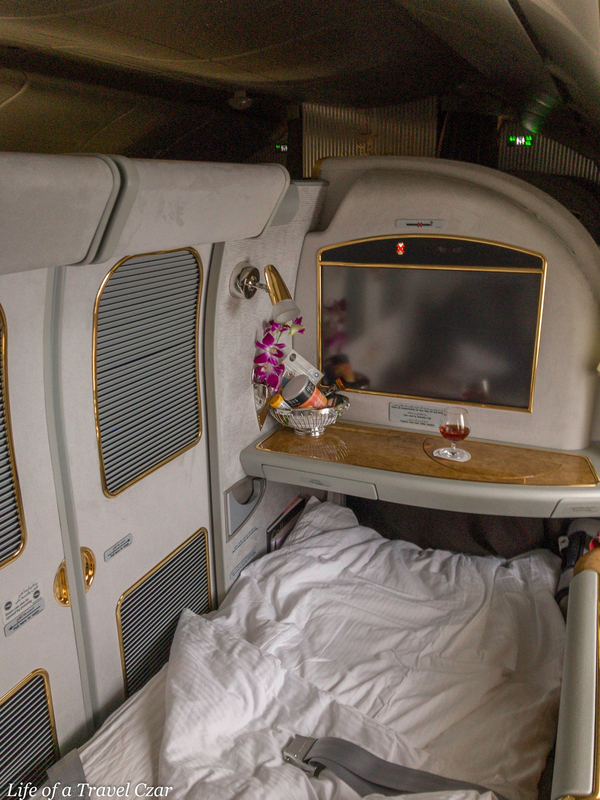 This flight is also on the Airbus A380. 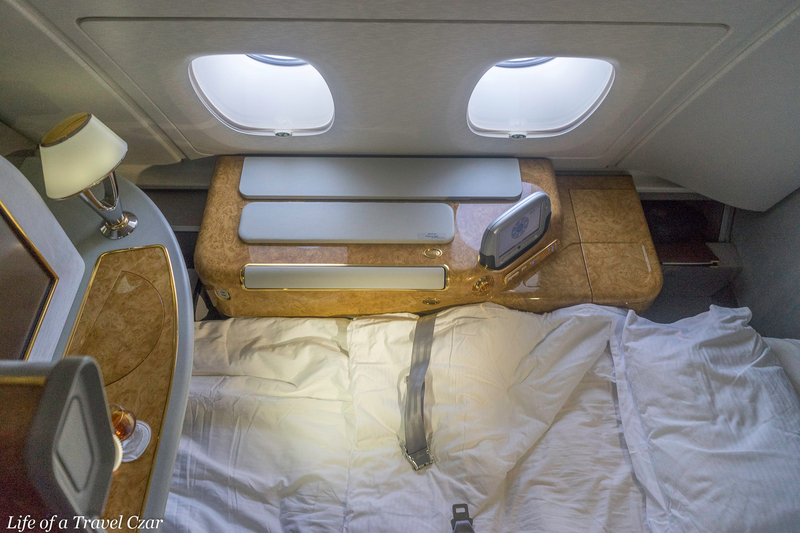 The cabin is located at the front of the upper deck on the A380 which contains are 14 fully enclosed First Class ‘suites’. 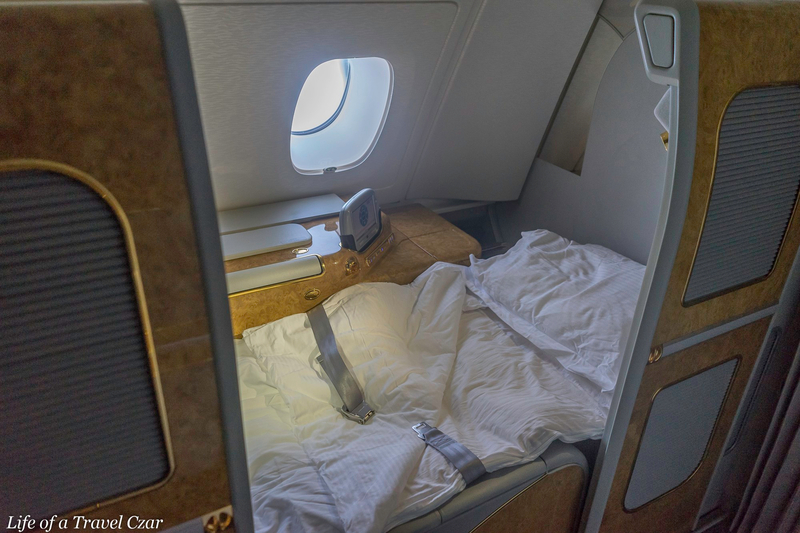 I have reviewed the suites on the New York to Dubai leg of the journey and the cabin is broadly the same so do check out that review here for the full detail. 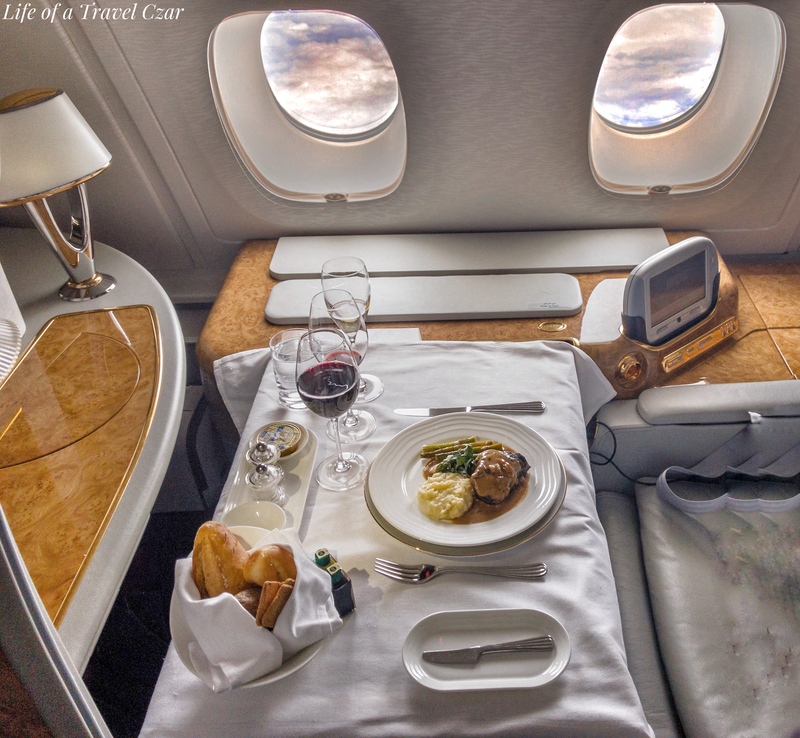 There are some differences in product; what Emirates lacks is standardization across their fleet. 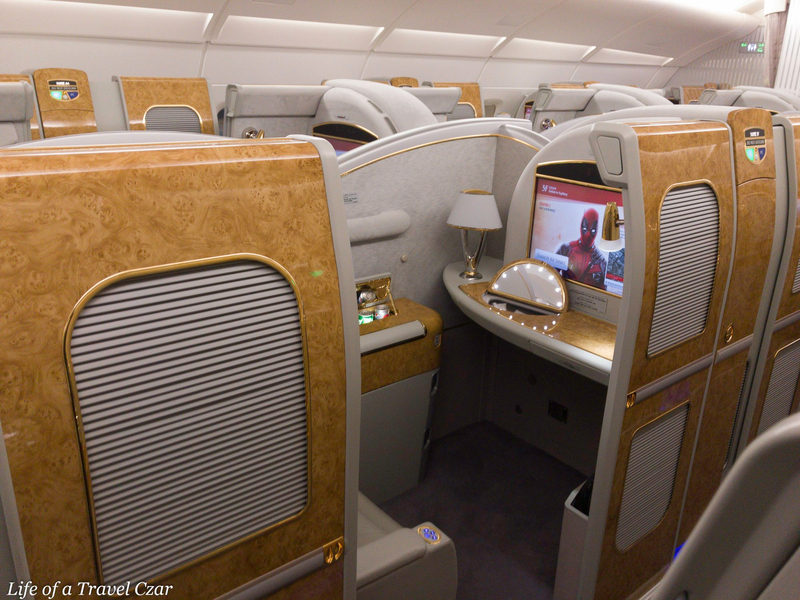 There are various generations of designs across their A380s (which are minor) but they often do not upgrade the entire fleet for those changes. 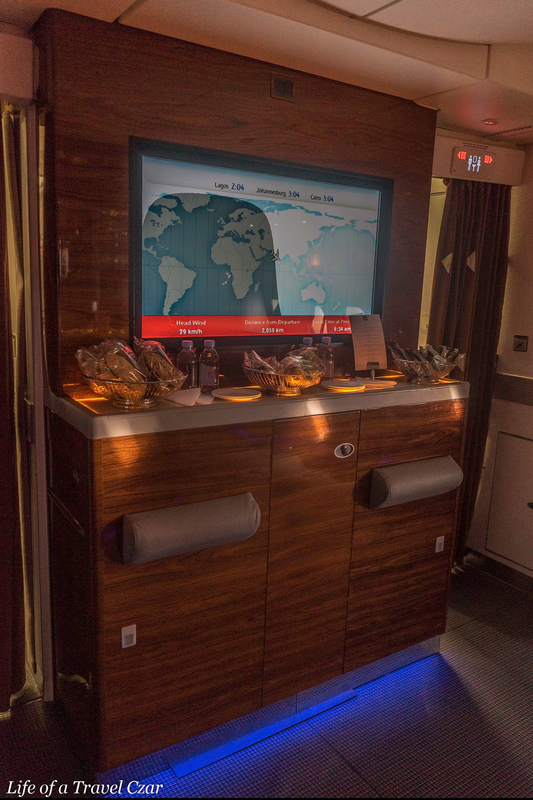 This is an older generation A380, which has a less attractive inflight entertainment product. 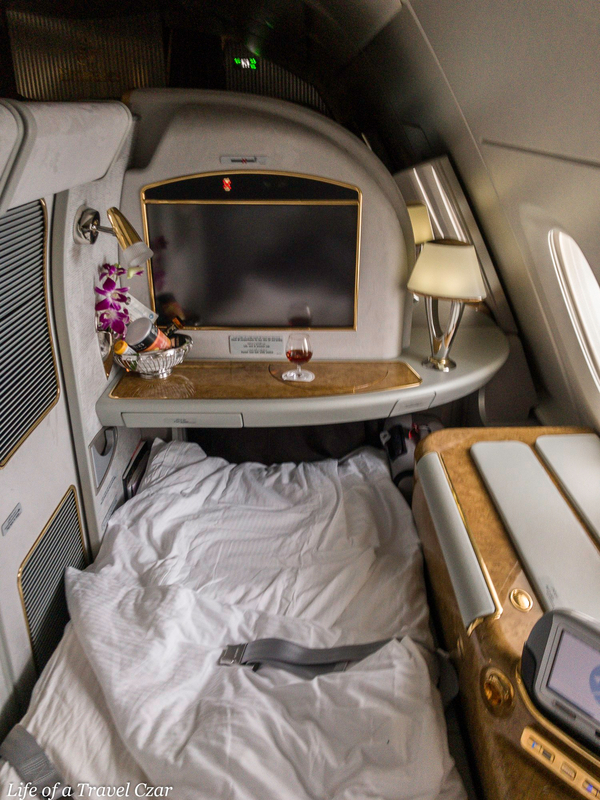 The screen is slightly smaller and instead of a full LCD tablet there is a hand console which is more akin to a Gameboy – it’s not the easiest to use (you can see a photo of it in “The Bed” section – it’s very different to the one on the previous flight). Shortly after take-off I have a nap. 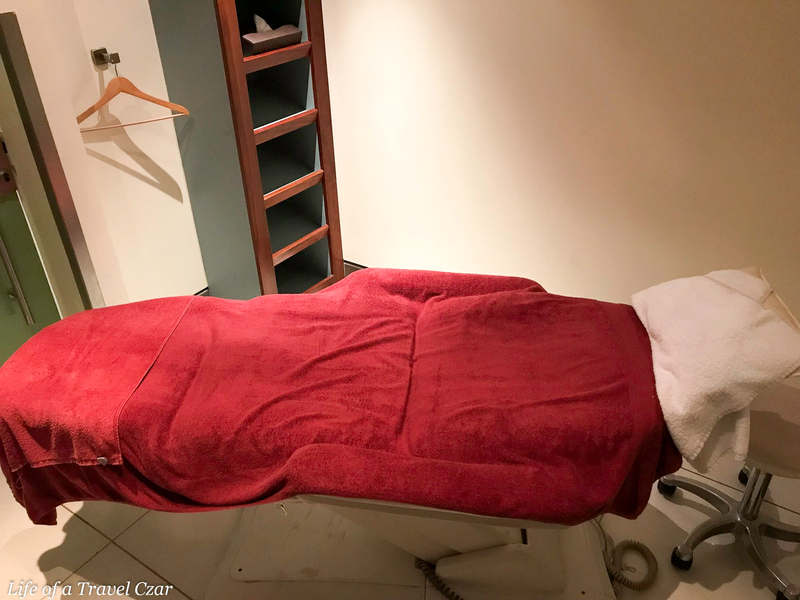 The seat is transformed into a fully lie-flat bed with a comfortable mattress, plush duvet, smooth cotton sheets, and pillows. I wake-up and decide to keep snoozing but opt for a little company with a beautiful glass of the Hennsey Pardis. 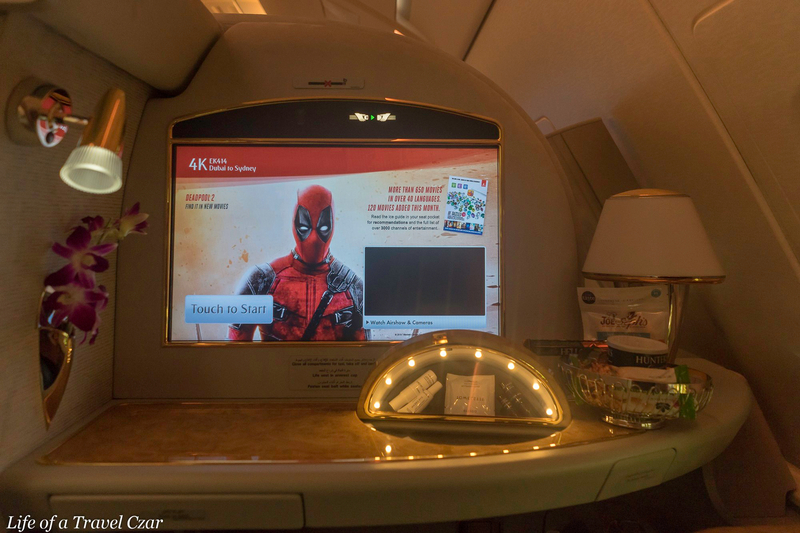 Notwithstanding that the system is not the latest, there is still the same extensive selection of movies, TV shows and gaming available as the previous flight. There are also external cameras with the view of the skies and an interactive moving map to track where you are during the trip. There is also a news channels to keep you up to date with the happenings on the ground. I switch from my Disney fest on the last flight to programming more for my age. I watch the movie Game Night, which is absolutely hilarious, and a Beautiful Mind! Again the inflight entertainment is enjoyed with the beautiful Bowers & Wilkins Active Noise Cancelling E1 headphones. 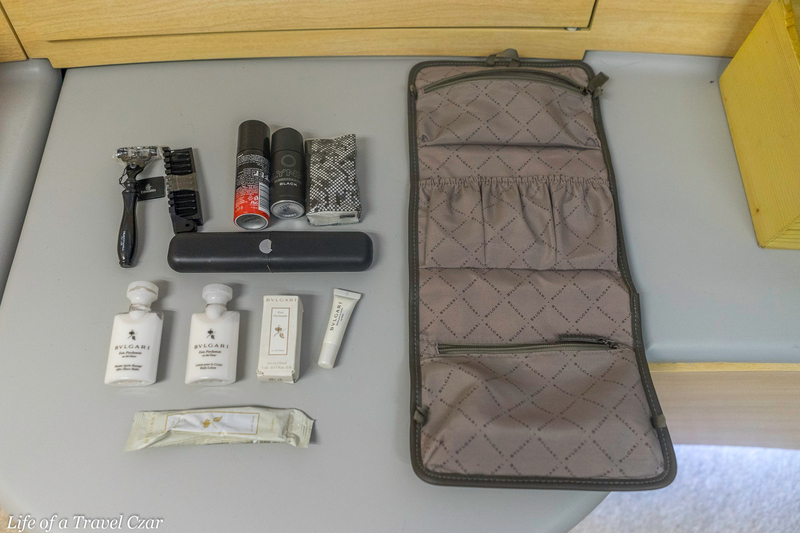 Emirates also provide a stylish Bulgari amenity kit and their cutting edge ‘moisturising’ pyjamas on this flight – there slight differences in the amenity kit design but it’s broadly the same as the last flight, so you can check out the review there. 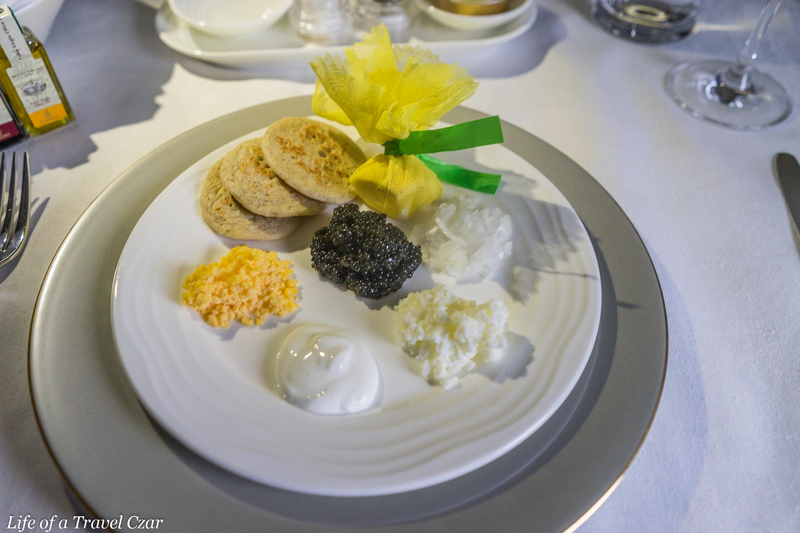 The caviar service is the same as my earlier flight so here is my review of the moment. 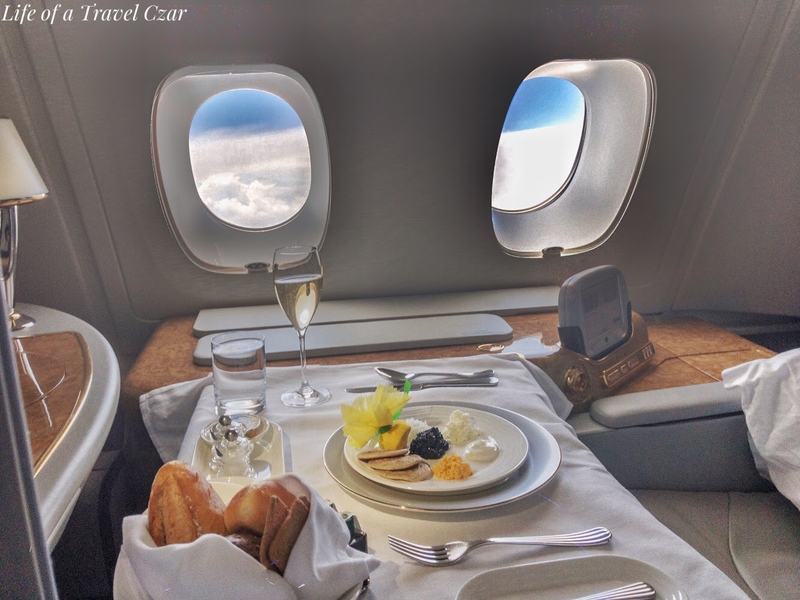 There’s something quite moving when you guess whether the blinis are as fluffy as the clouds outside your window. 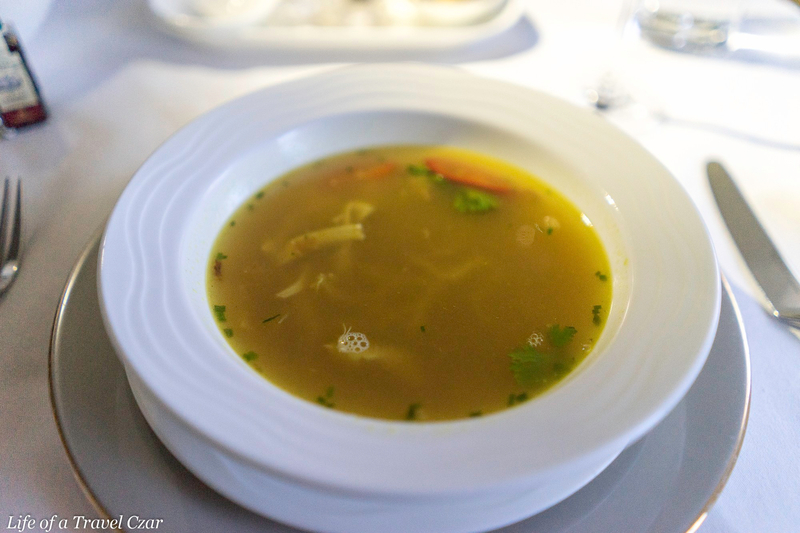 The next course is the hearty but simple Asian Chicken Soup which is a fragrant broth, tender chicken pieces with lemongrass, chilli and fried shallots. The dish is a mix of east meets west, with the succulent fall-apart short ribs oozing with the rich buttery beef flavours melding wonderfully with the ginger, coconut and star anise. The creamed potatoes add a wonderful gooey touch and the asparagus adds a little crunch to the dish. 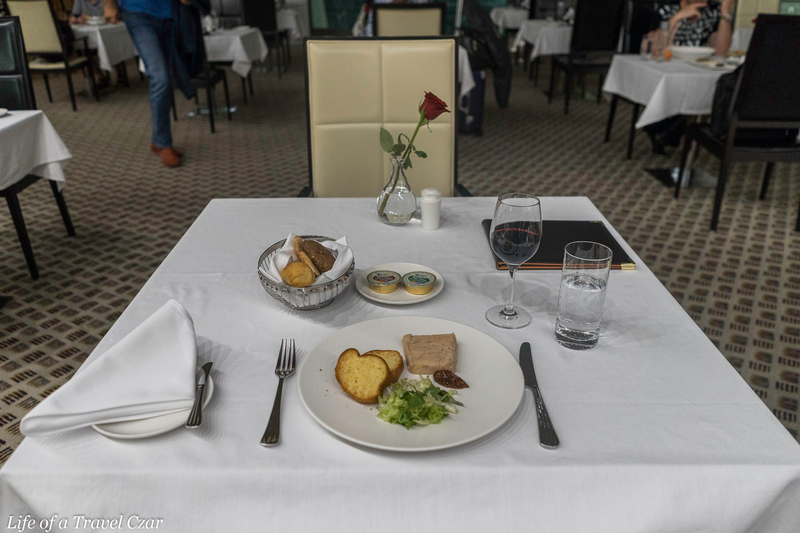 The dish is simply the dream as you gaze out at the clouds. You’ll notice a few wines on the table. I am not really an alcoholic. I did try to match the dish with a few wines before settling on the Ponet Canet. The others didn’t quite have the swing through to go with the short ribs. The Ponet Canet is lovely. On the nose a beautiful rich blueberry style spiced fruit concoction impresses and eases into the match with the oriental touch of the dish. There’s beautiful blackberries on the palate with hints of cedar and coffee with a touch of citrus in the aftertaste. There’s some pretty solid tannins which suitably deals with the fat in the short rib which makes it a good pairing. A broad range of Arabic mezze brought out and the selection is lovely. There is Homous Beiruti, Moutabel Potato Harra, Spinach Bel Zeit, Makdous with Muhammara, Stuffed Vine Leaves, Spicy Cheese Sambousek, Tabouleh and Potato Kibbeh filled with Olives. It’s rustic and gives one a taste of the Middle East. 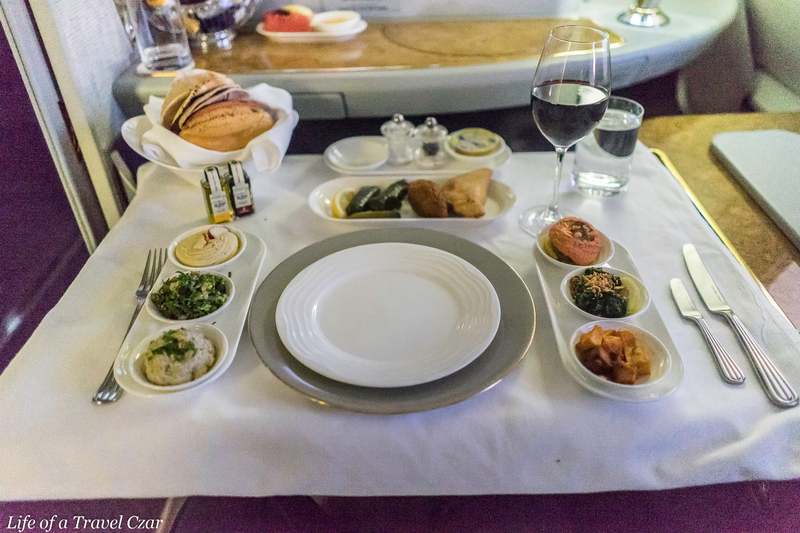 I actually ate most of the dishes and enjoyed it more than some of the other carrier’s mezze platters – it has variety and beautiful aesthetics and I loved the sunset which created the perfect moment. I love the shower suite. The experience was just as magical the second time around. 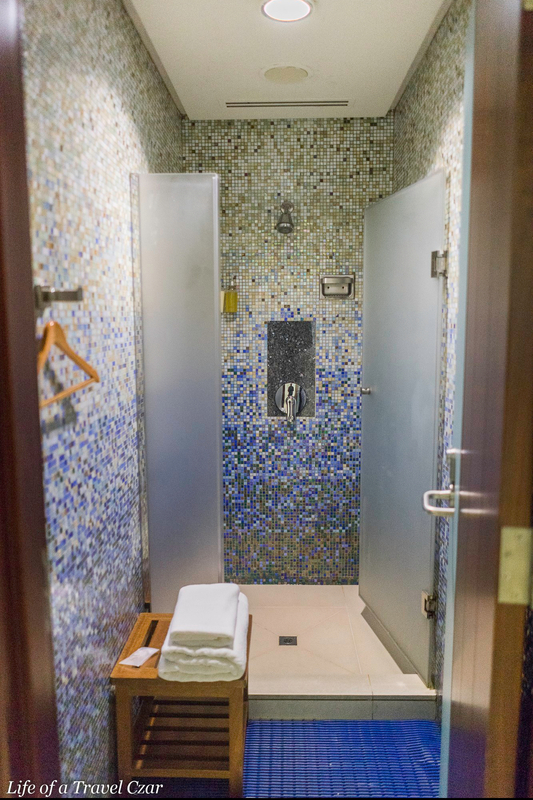 As soon as you step into the shower suite the heated floor is the perfect introduction to the experience. The beautiful aesthetics of the shower suite is a dream and I make full use of the five minutes of running water and the amenities for a wonderful experience. 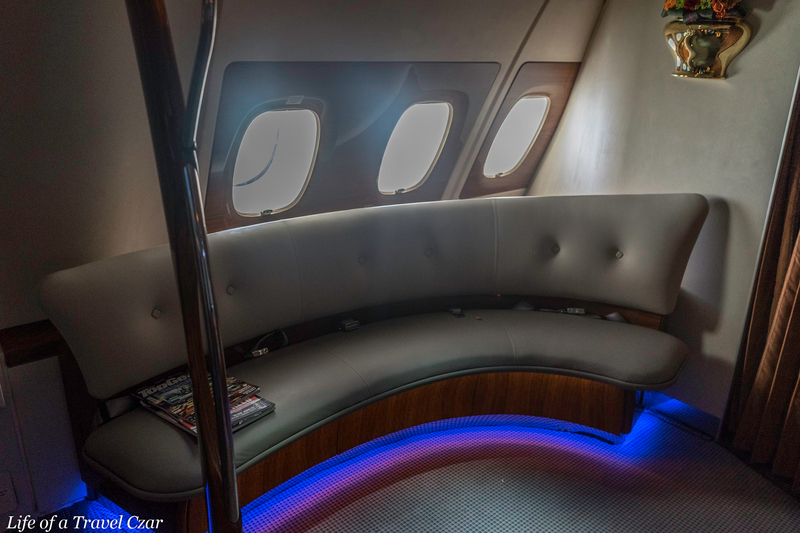 I visit the onboard bar at the back of the Business Class cabin. 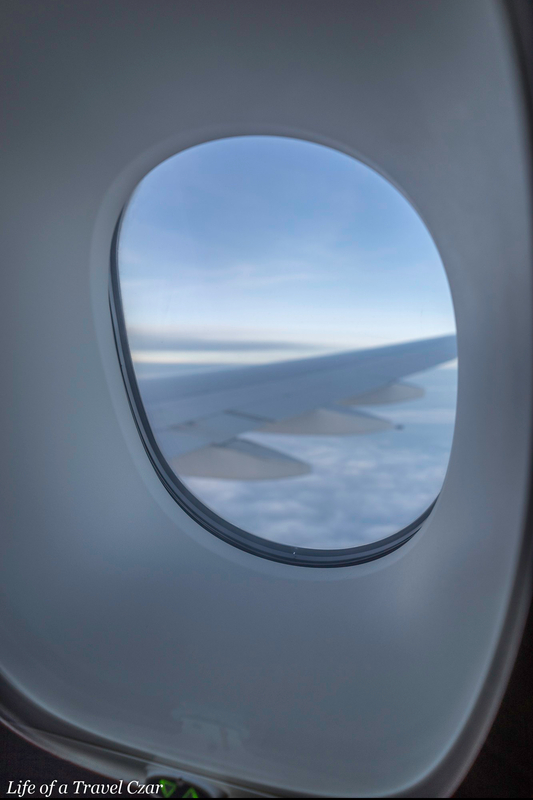 I relax for a while and enjoy the view outside and engage a bit with the cabin crew. It is a relaxing location when it’s not packed, but I do head back to my suite to continue sipping on the Pardis. 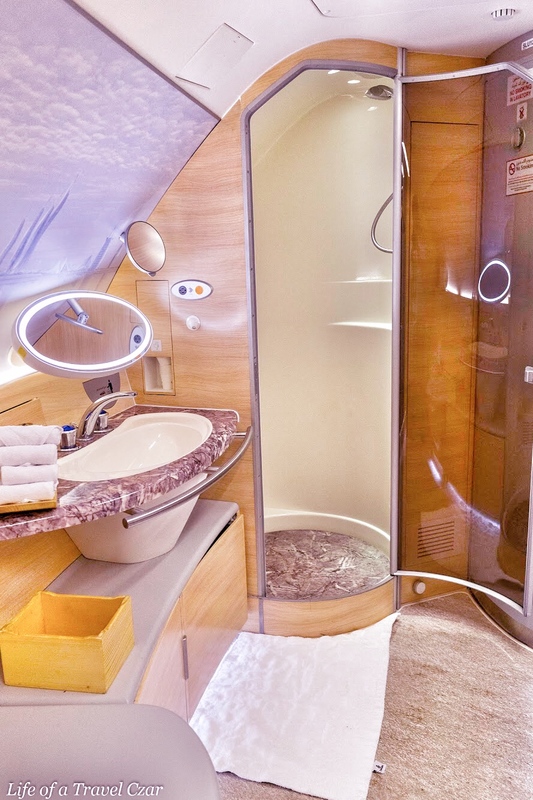 It’s tough to give you the full context / overview of the cabin, the suite, the shower and the onboard bar in just pictures. Here is my video diary of the experience. 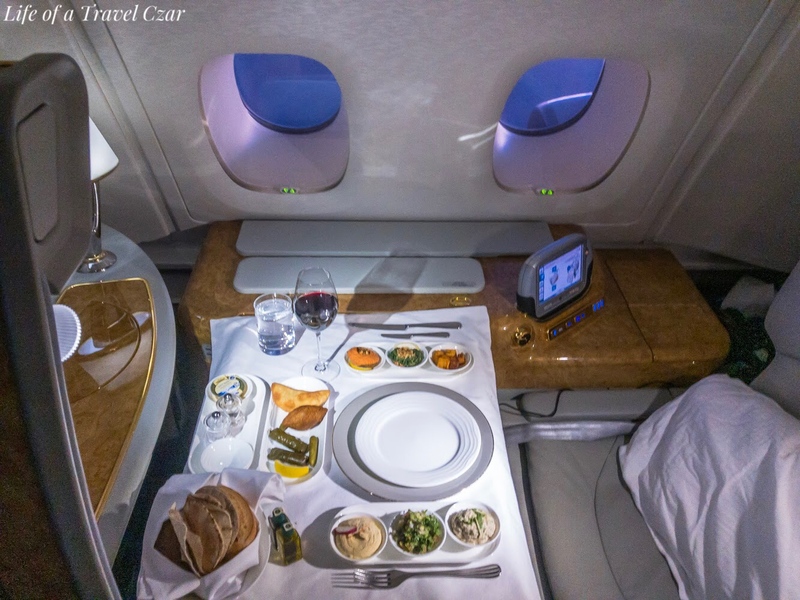 I will reiterate what I have said about Emirates previously, as their service and product was generally consistent. A couple of points to note from this particular flight; the crew were on point with their service. In fact, they went the extra mile and always delivered. 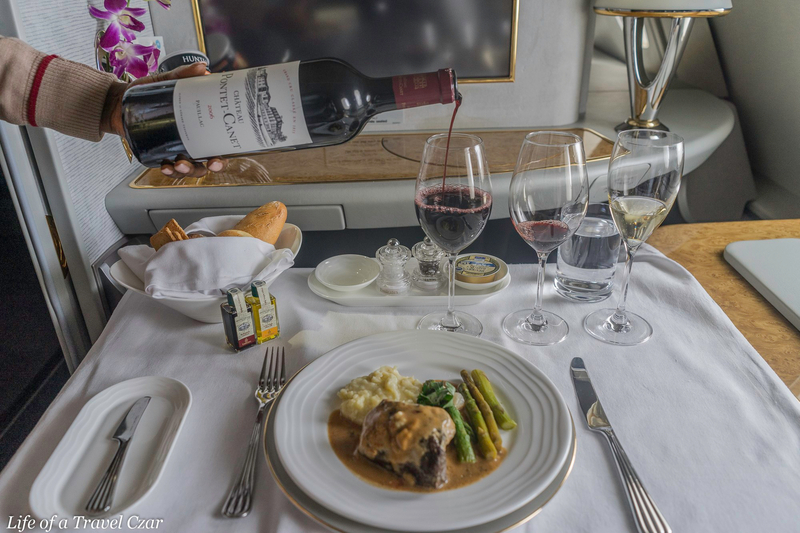 I love the dine on demand which some airlines don’t even offer in First Class. 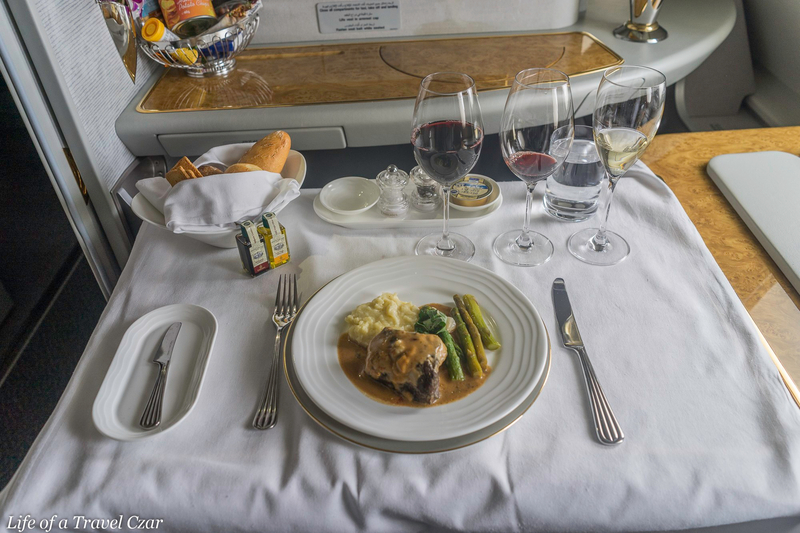 This allowed to tailor my meal choices and stage my dining during daylight moments of the flight which makes for better instagramming. The flight was extremely enjoyable and I just loved the shower (even though I tried it for the second time). There was hiccup with the chauffeur drive in Sydney. As I left the flight and raced straight to the exit post clearing customs and immigration etc., there weren’t enough drivers so I managed to swap my name with another passenger and secured a driver. The driver mentioned that Emirates in Sydney subcontract the drivers to a company which does not have enough drivers at peak times. So, my advice is to leave the plane and get to the chauffeur point as quickly as possible to avoid long wait times in Sydney.